From the 1960s onward, the rate of change, even in rural areas, sped up enormously. Children of farming families left the land to work in local towns and cities and for a while, Abberley was in danger of becoming a dormitory village. In recent years, with the rise of home and remote working, and the resurgence of interest in specialist, small-scale farming, this situation has changed and Abberley has begun once more to grow. Why did generations leave & then return? Is Abberley a better place to raise a family? Is life simpler & more comfortable? How has rise in school leaving age affected retention of young people in village? How has housing provision developed (council housing, barn conversions, farms & let properties)? How is technology changing village life? 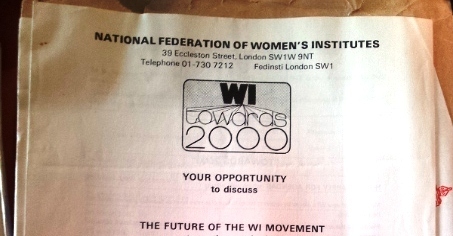 1968 : The WI organised a conference on the countryside at Central Hall. 1972: The WI exhibition, This Green & Pleasant Land?, took place at the Ideal Home Exhibition. The Carnegie United Kingdom Trust (CUKT) gave a grant for the Town & Country Project. The AGM passed resolutions calling for a full free family planning service & for more nursery education for children. The AGM confirmed that NFWI ‘believes in the principle of equality of opportunity & of legal status for men & women & pledges itself to work to achieve this’. 1987: A resolution at the AGM called for better control of the credit industry. 2000 : The Prime Minister addressed the Triennial General Meeting & was heckled. WIs organised a ‘Buy British, buy local’ fortnight. 2001: The Volunteers’ Hours Survey taken from 1,000 WIs, showed that their members devoted 3,477,312 hours to voluntary work each year. During the Foot & Mouth crisis, NFWI called on Government to support family farms. NFWI invited to join the Rural Task Force.